British singer Olly Murs believed he was born to be a music star. So, when The X Factor told him “no,” he wasn’t about to listen. PLUS: How does Olly Murs give back? 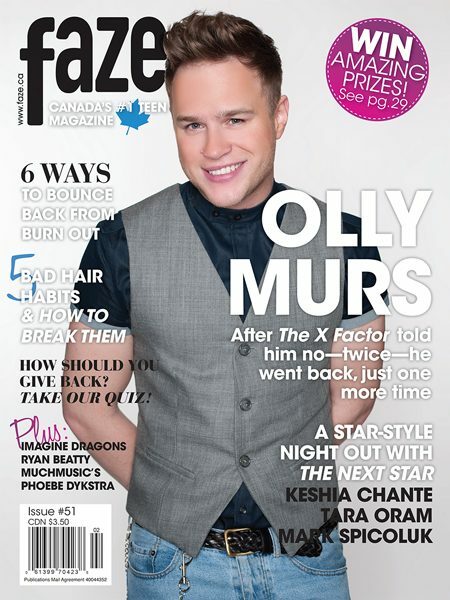 Go behind the scenes at the Faze Olly Murs cover shoot! In your life, who has inspired you the most? Bonus: If you star on any reality TV show, what would it be? My Summer Bucket List: What’s on yours? QUIZ: How Can You Give Back? Take our quiz! Up For Grabs! : Loads of stuff you can win! Rant: Awkward‘s Jillian Rose Reed took some time to rant with Faze. Photography by David Hou. Art direction by Alana Yip-Hoi. Styling by Carolee Custus. Olly is wearing a Nordem Hirst shirt, a Christopher Bates vest and Olly’s own jeans, belt, shoes and chain.